If your older Windows Phone 8.1 phone is one of the lucky ones, we're here to walk you through the process. 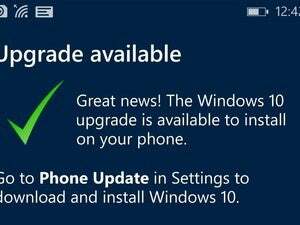 If you own an older Windows phone, you may finally be able upgrade it to Microsoft’s most recent operating system, Windows 10 Mobile—for free. 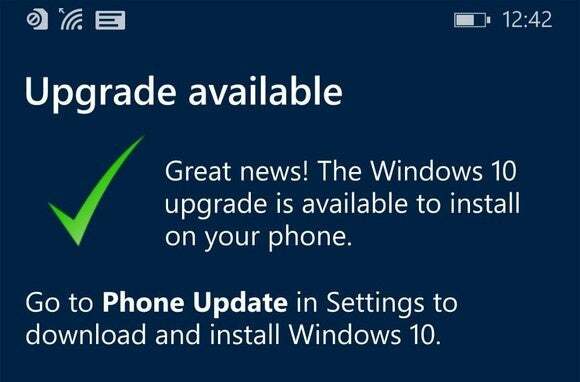 Microsoft began offering Windows 10 updates to most Windows Phone 8.1 phone owners on Thursday. The process can be a bit quirky in spots, though, which is why we’re here to walk you through it. Our Windows 10 Mobile review should introduce you to the high points of the new OS, such as Windows 10’s close ties to other devices in the Microsoft ecosystem, including the Xbox One. Your existing Windows Phone 8.1 apps should still work, with a framework for new, universal apps to gradually replace them. Microsoft is restricting the Windows 10 Mobile upgrade to just a subset of some of the most popular Windows Phones: the Lumia 1520, 930, 640, 640XL, 730, 735, 830, 532, 535, 540, 635 1GB, 636 1GB, 638 1GB, 430, and 435; plus third-party phones such as the BLU Win HD w510u, BLU Win HD LTE x150q, and the MCJ Madosma Q501. If you own a classic Windows Phone like the Lumia 1020 or the Lumia Icon, well, you’re out of luck. Microsoft may add additional devices to this list, but don’t hold your breath. 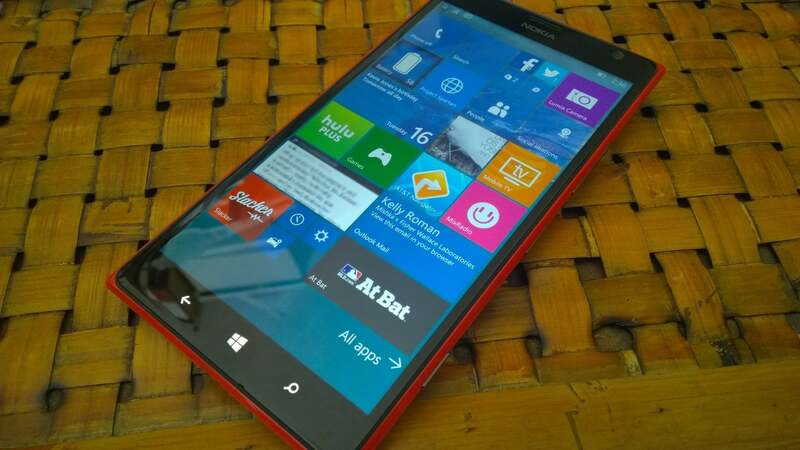 An early build of Windows 10 Mobile on a Lumia 1520. Plan on setting aside a bit more than an hour for the upgrade, though most of that time will be spent simply keeping a watchful eye on the phone as it updates itself. Before you begin: Back up your data, just in case. 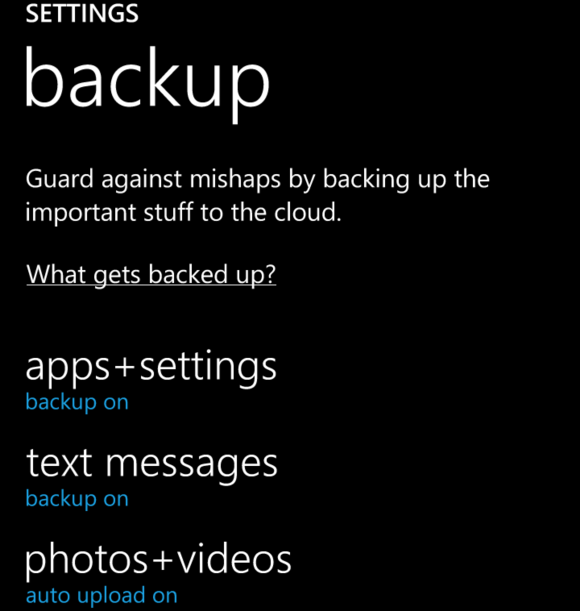 Go to Settings > Backup, and send everything to the OneDrive cloud. You can also simply connect your phone to a PC via a USB cable and copy over data to an external hard drive, too. Make sure you always have backup turned on before you begin. Next, grab your older Windows Phone and make sure it’s charged. Install the Windows 10 Upgrade Advisor app, which serves as your digital concierge for upgrading your phone. 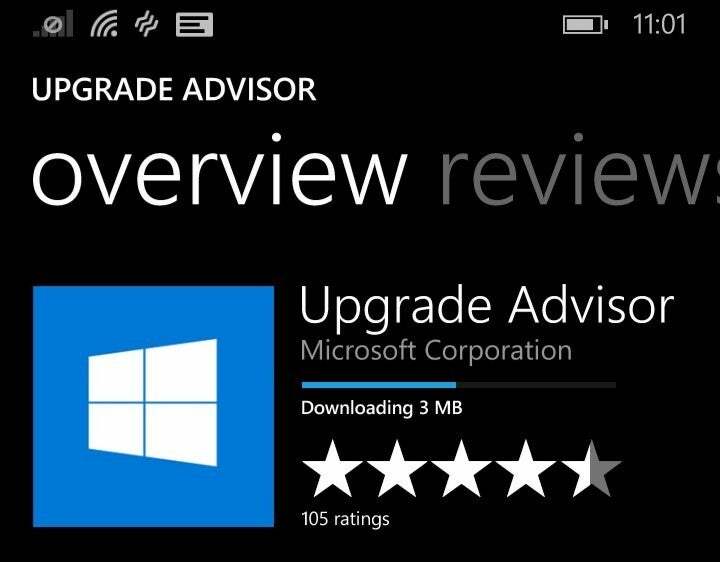 Microsoft’s Upgrade Advisor app is used to facilitate the Windows 10 Mobile upgrade from Windows Phone 8.1. To obtain the app, you can visit Microsoft’s site, click the link, and try to negotiate Microsoft’s app store. When I tried it, though, Microsoft wouldn’t let me log in. I found a somewhat clunky workaround: Either open Microsoft’s direct app link on your phone, or (if you’re reading this on a PC) email that link to yourself, and open it on your phone’s email client. Either way, if you open that link on your phone, it should launch the Store app and take you straight to the Upgrade Advisor page. Downloading the app should take just a minute, as it’s only about 4MB in size. Once installed, open Upgrade Advisor. The app will confirm that your phone is approved—or it should. I was a bit bummed to discover that my Lumia 635 was ineligible, perhaps because it had too little memory. In any event, tap the Next button, and the Advisor app will begin determining whether you can download Windows 10. My test Lumia 930 immediately informed me that a Windows 10 Mobile update was in fact ready, while a Lumia 830 received the slightly disappointing message that Microsoft was instead “working with your mobile operator and phone manufacturer to make the upgrade available for your phone and you’ll see a notification when that’s ready.” That means you won’t get Windows 10 today. Don’t be surprised if you get that message, according to Microsoft. “The availability of Windows 10 Mobile as an upgrade for existing Windows Phone 8.1 devices will vary by device manufacturer, device model, country or region, mobile operator or service provider, hardware limitations, and other factors,” a Microsoft representative told me. 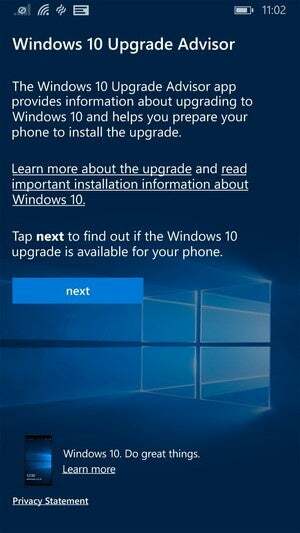 If your Windows 10 update is available, however, your phone should tell you to access your Settings menu and select the “Update your phone” option to begin the process. I did so, and discovered that the update had already begun downloading. This is what you want to see. Congratulations, you’re getting Windows 10 Mobile! From here on out, the upgrade should go relatively smoothly. My actual installation took about 37 minutes on the Lumia 930, with an additional 11 minutes or so to manage the upgrade of my installed apps. Afterward, your device will restart. 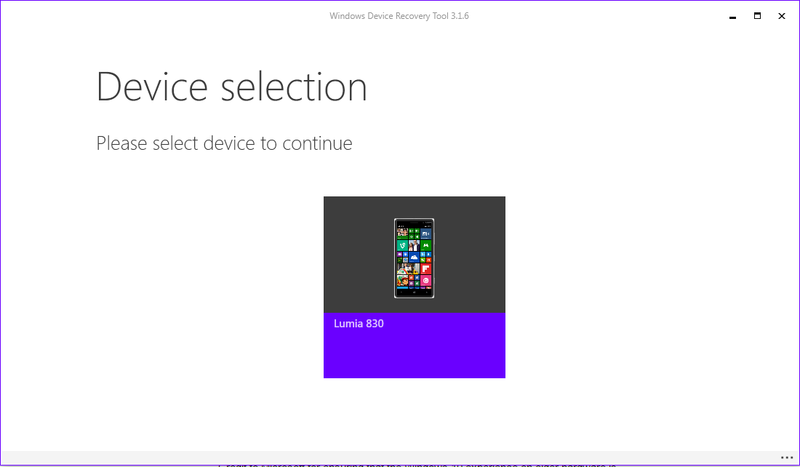 My Lumia 930 hung with an error message, but an additional restart fixed it. Congratulations! You’re almost done. Now, for some housecleaning. Take a spin around Windows 10 Mobile, as we did in our review of the Windows 10 Mobile OS. Note that you’ll probably need to reconfigure some apps like Outlook Mail (or just Outlook in Windows Phone 8.1) and add back your login information, and walk through the introductions to OneDrive and other apps again. (Chances are those apps will begin updating in the background.) Take a few minutes to launch these apps, just to ensure they’re properly configured and will begin sending notifications. Don’t forget Cortana—she’ll preserve your preferences in the cloud, but she’ll need you to tap her tile to wake her up. If something goes really wrong, you should be able to use the Windows Device Recovery Tool to reflash your phone with Windows Phone 8.1. You still have the option (for now, anyway) of flashing your phone back to Windows Phone 8.1, but you’ll need the special Windows Phone Recovery Tool to do so. Note that this will only recover the phone to vanilla Windows Phone 8.1, so you’ll probably want to update it to Windows Phone 8.1 Update 1 afterwards. Credit to Microsoft for ensuring the Windows 10 experience on older hardware is snappy and responsive. The bad old days of laggy Windows 10 preview builds seem to be over. I haven’t noticed any “loading...” screens while running apps or flipping back and forth to the home screen. 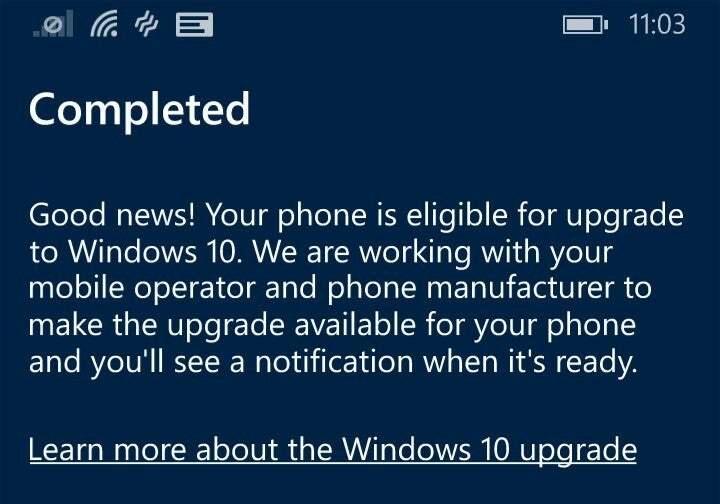 Now that you’ve upgraded to Windows 10 Mobile, you’re part of a rather exclusive club. Let us know how it's working for you in the comments.